It was snowing this morning when we woke up. It's one of those classic snowfalls, no wind swirling, just snow falling softly down, blanketing everything evenly. We had many great times on our deck this year, sharing wine and food with friends. Thanks for for reading and commenting, for continuing to grant me this little internet soapbox. Here's to a healthy and happy 2010 for all of us. I often find it quite difficult to identify the grape blend when drinking Champagne. I can think of many times when my guess was way off base. And even when I am drinking a familiar wine where I already know the grape composition, the grape character is not always as prominent for me as are other elements of the wine. This is probably a good thing, from the producer's perspective - they are trying to make a seamless wine that expresses something of a place. If the drinker feels "this is so very much about Chardonnay," that's probably not what the wine maker was going for. But it can be satisfying sometimes to drink a Champagne, and amidst all of the other sensations, to get a clear sense of the grape blend. Here are a few wines I drank recently that I found to show a particularly prominent varietal character. Not that it makes them better wines, I just find it interesting. (2004) Larmandier-Bernier Terre de Vertus Brut Nature Blanc de Blancs Premier Cru, $55-73, Louis/Dressner Selections / Polaner Imports. This has had several years of post-disgorgement aging. The current release is 2006, I believe. 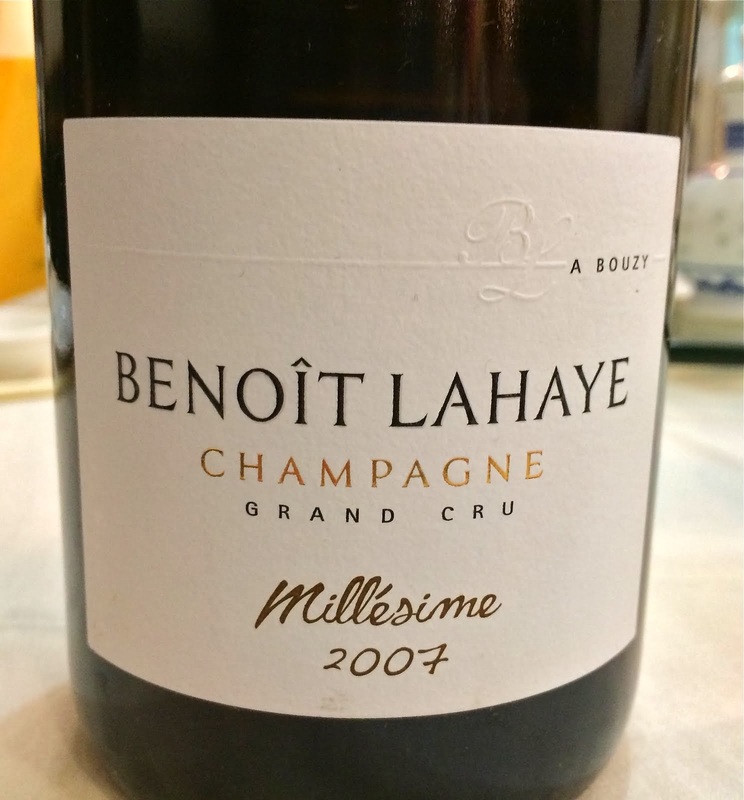 It's funny to use this wine as an example, as according to ChampagneGuide.net it comes from a single terroir: "three adjacent parcels totaling 2.5 hectares, located on the chalky side of the village along the road to Le Mesnil." You'd think that this single terroir wine made in the incredibly pure Larmandier-Bernier style would be all about a particular place. And perhaps more experienced or more careful drinkers would find terroir to be the most prominent aspect of this wine. For me, with brunch on Christmas morning and then savored with BrooklynLady over the rest of the afternoon, this wine was a glorious expression of Chardonnay. Gentle and completely harmonious, the salty minerality of its youth is now in the background. The finish is delicately floral and very fragrant, and the sensation that lingers for me is pure, ripe Chardonnay. NV Roger Coulon Champagne Tradition Brut, price unknown (this was a gift), Steven Berardi Selections, Elizabeth Imports. The Coulon estate is located in Vrigny, a place where Meunier does very well. From what I've read, this wine is only 50% Meunier, but it was defined by Meunier for the first 45 minutes or so. Broad marzipan and orange peel aromas, exuberant and expansive. I am confident that I would have pegged it as a Meunier-based wine had I drank it blind withint the first hour open. After an hour or so open, the wine lost some of its Meunier exuberance but gained harmony and precision. It was delicious in both incarnations. NV Billiot Champagne Brut Reserve Grand Cru, $45, Terry Theise Selections/Michael Skurnik Imports. I think I've had this wine more often than I've had any other Champagne, and I always enjoy it. It smacks of pure dark Pinot fruit, juicy and rich, but completely in control. I had a glass the other night with friends, and although I was distracted by a hundred different things, I remember at one point, after putting my nose in the glass, thinking "wow - that is indisputably and deliciously Pinot Noir." Some people feel that Billiot's Brut Reserve is a bit high in dosage. I think it works this way. Somehow the relatively high dosage brings out the joyfulness of the Pinot fruit. Many of the wine people I know share seem to share this generous spirit regarding even the finest and rarest of wines. A party of 15 people? Sure, crack open the magnum of 1995 Giacosa Barbaresco Santo Stefano. Stopping by for a quick bite on a random Monday night? Pop open the Selosse. Some folks, myself included, are not able to afford wines like these very often, and when we do buy the odd great bottle here and there, the idea of opening it can bring just as much dread as excitement. "When is the absolute perfect time to open this bottle? And who is the perfect person to drink this with?" I say this from past experience - it is all too easy to simply never open the bottle. It's so liberating to be free of this hoarding mentality. Not that there's anything wrong with it - do as you please with your wine and be happy. But I realized that I am much happier opening that bottle and sharing it than I am saving it for a hypothetically more-special-than-now occasion. Especially if I'm with people who love wine. Who else should I drink it with, if not you? I got lucky a few times this past week, and hung out with people who love to open great bottles. And so I got to drink some incredible wines, several Champagnes among them. In light of my last post on a blind Grand Marque tasting, I thought it would be especially fitting to share a bit about these Champagnes. (2007) Jérôme Prévost La Closerie Les Béguines Champagne Rosé Extra Brut, $105, Polaner Selections. This is the first vintage (although it technically is not a vintage wine) for Prévost's rosé, and it is a thing of beauty. So vibrant and expressive, such incredibly well defined aromas and flavors, really energetic and vivid. This is all Meunier, and it smells like fresh roasted hazelnuts, marzipan, blood orange, baking spices...the nose is amazing. The texture shows such finesse and grace, and yet there is a wild streak. I'm guessing here, but based on the meager allocation granted to Chambers Street and Crush, I bet that no more than 4 cases of this wine made it to NYC. Perhaps fewer. And yet a super nice and generous guy named Michael Wheeler (formerly a partner at Polaner) brought a bottle to a gathering of about 15 people. It is an astounding wine that I hope to drink again one day. By the way, somebody brought a bottle of the (2006) Jérôme Prévost La Closerie Les Beguines Extra Brut to the same gathering, and somehow I neglected to taste it. Too much insane wine on the table. NV Selosse Champagne Rosé, about $175, Imported by Rare Wine Company. Joe Salamone, one of the buyers at Crush and an all-around lovely guy, decided to bring this bottle to the very same gathering. That's right - Prévost and Selosse rosé, sitting there on the same table for all to sample. This wine was also quite special, but it took several hours for it to open up and show its true harmony and depth. Oxidative and gingery, this is a delicious and broad wine. On that night I preferred the Prévost wine, but believe me - I would be most happy to experiment with these two wines again. Ledru owns five hectares in Ambonnay and one in Bouzy, with a total of 30 different parcels. All of the vineyards are planted with cover crops and tilled, and she uses no herbicides or insecticides, seeking to work her vines as naturally as possible. The same sensibility extends to the cellar, where she makes the wines without filtration, without cold-stabilization and without any sulfur at disgorgement. Fermentation is all in stainless steel and enameled steel tanks, for their neutrality, and the malolactic is allowed for all wines. “I do the malo because for me it’s natural,” she says. The wines are aged for a respectably long time on their lees, averaging about three years for the brut sans année and five years for the vintage wines, and all disgorgement is done by hand, in a fashion not dissimilar to how it might have been done two or three generations ago. Ledru only bottles about half of her production, meaning that there’s very little wine to go around, and the other half is sold to the négoce, most notably to the houses of Pol Roger and Deutz. (2005) Cédric BouchardLes Ursules Brut Blanc de Noirs, $80, Polaner Selections. Some one brought a bottle of this wine to that absurdly Champagne-laden gathering, but I don't know what vintage. I must say, a wine like this shows best when it is the sole focus of attention, its delicacy and understated grace not overshadowed by louder voices. So I opened a bottle later in the week when a new friend came over for dinner, and we loved it. The character of the ripe 2005 vintage expressed itself in a creamy vanilla tinged aroma, but Bouchard's deeply vinous and expressive dark fruits hummed a resonant baseline. This was really singing an hour and a half into our meal, 2 plus hours after we opened it. I'm telling you, it's the holidays. Just open that bottle. It feels good. Alex Halberstadt, a Brooklyn-based writer who covers wine for The Faster Times, an online newspaper, recently invited me to his house to participate in a blind tasting of Champagne. There were 9 of us in total, and 15 wines. Not bad for a random Monday night. The point of tasting blind is to remove information that can bias the taster during the experience of tasting. But how much information should be removed? Obviously, tasters do not know the identity of the wines they taste. But there are varying degrees of "blind." Imagine, for example, that you wanted to do a tasting of Pinot Noir with friends, and your idea is to compare new world wines to old world wines. Do you tell people the theme and ask them to categorize the wines as they taste? Do you instead tell them only that it is a Pinot tasting, and see where the discussion goes? Do you tell people that they are drinking two types of Pinot, but not tell them what types? There are many ways to do this, and each has its merits. We knew nothing whatsoever about the Champagnes we tasted - Alex decided to share the theme of the tasting only after we discussed the wines. We went through all 15 wines and then discussed each one. As you would expect with a group of 9 people tasting of 15 wines, there were many different opinions. But there were a few things that everyone seemed to agree on: no one loved the wines as a group. Everyone found a few wines to like, but as a group, no one was overly excited. When asked what we thought of the overall quality of the wines, Garrett Oliver, the brewmaster of the Brooklyn Brewery, said "They were fine, but I drank some great Champagnes last week, and none of these stands up to any of those." I felt the same way - there were several wines I liked, but as a group I was not terribly impressed. I felt that the wines lacked any kind of soil character. None of them were chalky. And none of them showed any real individuality. They actually resembled each other a lot in terms of character and flavor profile. Maybe this was a symptom of drinking 15 Champagnes in a row, maybe not. What had Alex done, here? What were we tasting? I had an idea about halfway through, but I wasn't sure. At the end of the discussion, Alex said "Bloggers and wine writers all seem to be writing about grower Champagne now, and you never read anything about the other wines. I thought it would be interesting to do a tasting of the Grand Marque Champagnes, the wines you are most likely to encounter in any given store." I understood immediately why Alex kept the theme a secret. If I knew that I were tasting these 15 wines, I would have been biased. Not that I would dislike them automatically - I'm a more honest taster than that, but I would have approached them differently, with low expectations. Alex wisely allowed us to approach these with whatever expectations we as individuals bring to a tasting. I, for one, want to like the wines at a blind tasting. And I found some things to like in this tasting. I liked the first wine I tasted better than anything else, the Piper-Heidsieck. It felt like it had been bottled at low pressure, it had lovely dark fruit, it had finesse, and it was very expressive. I loved it. I remember thinking, "Could this be a Cedric Bouchard wine?" I wonder if this wine been the 8th wine in the lineup, whether or not I would have liked it as much. By wine #8, I understood that I wasn't crazy about whatever it was we were tasting - the "I'm about to taste 15 Champagnes, and I love Champagne" magic had worn off. But I liked it enough during this tasting so that I will make a point of drinking it again. My other favorites included Roederer, Henriot, Pol Roger, Taittinger, and Lanson. I would gladly drink a glass of any of those wines, should they be offered to me. But I don't think that I'm ready to start using any of my already meager Champagne budget to buy these wines. Before doing that, I'd like to do a blind tasting that includes these wines and an equal number of wines from producers like Boulard, Billiot, Diebolt-Vallois, and Brigandat. That would be most interesting, especially if I didn't know the theme while tasting. I will also confidently tell you that the worst wine of the tasting, and almost everyone agreed on this, was the Moet White Star. It was just very bad. I'm so glad to have participated in this - it was a great idea, Alex. It's silly to dismiss wines because they're not popular (an odd thing to say about Grand Marque Champagne, but I mean popular among the wine circles I hang out in), but I think we all do it. I tend to be dismissive of exactly these Champagnes, and perhaps I shouldn't be. I really liked that Piper-Heidsieck. Maybe I'll buy one and drink it next to a comparable grower Champagne, both served blind. The other night my friend Adam invited a couple of people to his place for a night of wines from Pierre Gonon, the decidedly old school producer from St. Joseph. I don't drink a lot of northern Rhône wine because there are so few that I can afford that are also appealing to me. So many of them are simply way too big - high alcohol, overripe wines with Sour Patch Kid type acidity, wines that I have a hard time enjoying with food. Gonon is a producer whose wines are delicious, true to the place they come from, and entirely affordable. Cheap, I would venture to say, especially considering the quality they offer. The Pierre Gonon estate, now run by Pierre's sons Jean and Pierre, is a small estate with plots in several villages, but perhaps the most important plot is in Les Oliviers, a steep vineyard with southern exposition. Pierre Gonon planted his family's white grape vines there in the late '50s. And with the exception of wines that are literally 4 or 5 times the price, Gonon's white is the best white Rhône wine I've had (relatively small sample size, but work with me, people). I've had two vintages of the St. Joseph rouge (2006, 2007) and the thing that always strikes me when I drink these wines is the absolute clarity of their expression. It's like smelling and drinking a textbook definition of Rhône Syrah: meaty, olive-y, deeply fruited, and peppery, floral hints in the background. These are wines of great intensity and depth, but not of great weight. They are bold wines that show the gamy richness and full texture one expects from Syrah, but in an unadorned and elegant style. From what I understand, they age gracefully, too, something that I will test out myself, quite eagerly. And this wine costs about $28 before case discounts. We began our evening with the 2007 Pierre Gonon St. Joseph Blanc Les Oliviers, Fruit of the Vines Imports, $32. I love this wine - I LOVE it. A typical blend at 80% Marsanne and 20% Roussanne, but atypical in its freshness, elegance, and energetic character. The aromatics are just beautiful, with fresh pears, orange peel, honeycomb and a touch of something like nutmeg. It is an enticing nose that mellows and becomes more and more clear as the wine warms up. There is not a lot of acidity here, but the wine feels energetic and fresh on the palate, and the finish is long with pears and spiced honey. The wine is bone dry at 13.8 % alcohol. I would gladly drink this wine with roast pork or chicken, with rich shellfish like lobster, with almost enything you might throw at it. We came back to it at the end of the evening over a plate of cheeses, and it was particularly great with a washed rind goat cheese called Le Petit Fiancé des Pyrénées. The wine was at room temperature, and its mellow pear fruit and waxy honeyed richness complemented the grassy pungency of this delicious cheese. I love the way this wine interacts with cheese, and I've served it before with good effect. A reader who goes by 'michelecolline' recently left a comment saying "You keep eating Italian dishes with French wine....you making me crazy!" Well Michele, I've done it again. Adam cooked his version of sausage and peppers, topped with grated Parmesan cheese and gremolata, and we opened three of Gonon's reds. The 2007 Pierre Gonon Vin de Pays de l'Ardèche Les Iles Feray, $17, comes from young vines in St. Joseph and older vines just outside the AOC. The aromatics are bright with red fruit and flowers, and the sauvage notes that were so pungent about 6 months ago are less pronounced now. This wine showed so well the other night, balanced, juicy, and just delicious, and at 12.5% alcohol. The 2007 Pierre Gonon St. Joseph, $28, is just a great wine. It was at its best after a few hours of air, at the very last sip. Perfectly harmonious, and that's saying something because this is a brawny wine. The fruit is dark blue and bright red and feels like it came from tiny berries. At first the acidity was a bit rough, but when the wine comes together the fruit mingles with lavendar and bloody meat in a deeply satisfying way, and the acidity is more of a support than a major player. This is a wine that deserves to survive the next decade in the cellar so it can reveal all of its charms. We saved the best for last. Adam opened a bottle of 20 year old wine, the 1989 Pierre Gonon St. Joseph. I was so excited to drink this - anticipating it all day. And so of course it was viciously corked. Another time, 1989, you and I will meet again. The other night a friend and I went to Lot 2, a new-ish restaurant in a very quiet (read - middle of nowhere) part of Brooklyn. I love this area, actually, the stretch of 6th avenue between the Gowanus expressway and Greenwood Cemetery. Disingenuous realtors call this the South Slope, but I think Greenwood Heights is more accurate. Anyway, this is a quiet residential stretch of town. There is a public school, a few bodegas, a furniture design store, a coffee house, and not a lot else - nothing that inspires a special trip. There used to be a destination-worthy BBQ place on 20th and 6th, but it closed last year. Now, in the storefront right next door, Lot 2 is open. And it's worth a special trip. A bartender sporting a little mustache and arm garters who looks like he stepped out of a 1890's saloon. A discourse on butchering technique. Anything that has been "deconstructed," any kind of "foam," or "gelée." Not that there is anything wrong with those things - I enjoy them from time to time. But Lot 2 isn't about pretension or culinary pyrotechnics. Lot 2 is about excellent ingredients and simple but highly skilled preparation. The servers are very kind and competent, the space is attractive and homey, and the prices are reasonable. If none of this sounds special enough to make Lot 2 a destination, there is one other thing that might sway you: the incredibly high quality of the charcuterie. Lot 2 was opened by the guy who did the charcuterie at Grammercy Tavern, and charcuterie should be part of a meal at Lot 2. They also demonstrate a deft hand with pickles. We couldn't decide on appetizers (called small lots) because we wanted to taste them all. So we did, almost. We began with the pork jowl, and this was utterly fantastic, the best plate of food I have been served at a restaurant in a while (grain of salt - I don't go out that much). Think of that ubiquitous pork belly, in terms of presentation - a large square of meat with a ribbon of crusty fat on top. But this is jowl, and the meat is meatier than a belly cut. The accompanying Brussels sprouts were very good, and there were little pancetta croutons, as if the jowl might not be porky enough. It is this dish that will make me walk all the way down to 20th street on a snowy night in January. We also had cured lamb neck and cured pork neck served with house pickles and warm olives. The paper-thin slices of meat were subtly perfumed with spices, and although both were rich and delicious, we preferred the lamb. And because pork jowl and two kinds of neck really aren't enough in the way of charcuterie, we also had the lardo bread, a piece of crusty bread smeared with lardo butter and topped with Brussels sprouts leaves. This was the only thing we ate at Lot 2 that wasn't so great, and I suppose the owners felt the same way, as I notice that it is no longer on the menu. Although lardo still appears with the potato skins that come alongside the burger, in what I am sure is a winning combination. We tried two salads, and both were excellent. Shaved fennel with radishes and walnuts was a perfect rendition of this dish, and it was a great companion to the charcuterie. My friend Clarke and I were essentially jousting with our forks over the last bites. Chicory with pickled pumpkin was also delicious - bitter greens with sweet and sour pickles, very refreshing. We enjoyed this salad with the one entree (called big lots) we had, itself a story. Let me tell you how difficult it was not to order the lamb ribs with chickpeas, olives, mint and lemon. But we ate the better part of a pig to begin the meal, and it just seemed excessive. So we ordered pasta - garganelli with cauliflower, mint, capers, and romanescu. As Clarke said, "This dish has no business being this good." It was delicious, truly. Garganelli are kind of like large penne with deeper striations to hold the sauce. The seasonings were perfectly balanced and there was a spark from red chili flakes, but it is the texture of this dish that really got me. The pasta (which I think may be home-made) was cooked until just tender, and the whole dish was tossed with toasted bread crumbs, which gave every bite just the slightest gritty crunch. A real winner, this dish. And what about the wine list? It is small, but filled with interesting and inexpensive bottles that would be great to drink with this food. Savio Soares has a few wines on the list (Mouressipe from the Languedoc, Marcillet from Savigny-Les-Beaune, Héaulé from the Loire). Jeffrey Alpert has two fantastic wines here - the beautiful NV Benoît Lahaye Champagne Brut, mostly Pinot Noir from Bouzy, and fairly priced at $72, and the ethereal and gamy 2006 Ganevat Trousseau "Plein Sud" at $55. There are several interesting Italian wines too - you can see the list here. We decanted and drank the Ganevat Trousseau, and its progression from horse stable to rose garden with rabbits was perfectly harmonious with our food. If you are a beer person, they have several interesting craft brews too. We ended our meal with two cheeses, both from Jasper Hill Farms. Bayley Hazen is their excellent Stilton-esque blue cheese, and the cloth-bound Cheddar made by Cabot Creamery and aged in the cellars at Jasper Hill. I still don't like the cloth-bound Cheddar. I didn't like it the first time I had it, and I've had it several times since then and I just don't get it. But that's just me - it is a high quality cheese that everyone else loves, so trust me, everyone else is probably right. Lot 2 is well worth the trip. Go with a friend, go on a date, go for communal Sunday supper. Go check it out. 687 6th Avenue (near 20th street), Brooklyn. I'm traveling for work this week. I have this superstition that compels me to open a really good bottle of wine the night before I leave, something special to share with BrooklynLady. On Sunday night we at a version of Osso Bucco, ours braised with fennel, carrots, and orange peel. We opened a bottle of wine that I had planned on cellaring for many years, the 2006 Domaine de L'Arlot Nuits St. Georges 1er Cru Clos des Forêts St. Georges, $55-85, Daniel Johnnes Selections/Michael Skurnik Wines. Last year at about this time I visited Domaine de L'Arlot, stayed at the estate in Prémeaux-Prissey actually. I was very much impressed with the wines - very pure and full of character and complexity. The Clos des Forêts St. Georges is a monopole of the domaine, and sits next to the famous Les Saint-Georges, the great vineyard in Nuits St. Georges that is considered by many to be of true Grand Cru quality. Domaine de L'Arlot's Clos des Forêts St. Georges can be similar to the wines of Les Saint-Georges, showing a dark fruited muscularity, a sauvage pungency. I'm a recent but adoring fan. Although this wine will clearly repay a decade and more in the cellar, it was utterly delicious on Sunday evening. The oak is quite prominent on the nose, but the true character shines through. Deeply and darkly fruited, firmly structured, and with an inner cylinder of pungent animal perfume that emerges on the midpalate and gently pushes through the finish. Really a beautiful wine, a lot of character. And I'm confident that the oak will integrate with time. And then guess what happened...maybe 30 minutes in, while still putting the finishing touches on dinner, I poured another splash from the decanter and I noticed that the wine smelled corky, ever so faintly, but corky. Was it just that one whiff, was it a pungent note that resembled TCA? We sat down to eat 15 minutes later, I poured us each a glass, and there was no mistaking it - the wine was corked. Not savagely so, but corked indeed, and the aromatics had been overwhelmed. Isn't that wild? The TCA didn't show itself until the wine had spent about 30 minutes in a decanter. It was gorgeous before that point. We opened a bottle of 2006 Chandon de Briailles Pernand Vergelesses 1er Cru Ile des Vergelesses, $43, David Bowler Wines, instead, another wine I had planned on cellaring. It was lovely, more subtle and subdued, its stems more apparent. We both agreed that this wine, as lovely as it was, was difficult to drink after the first half hour of that beautiful Clos des Forêts St. Georges. Oh TCA, how I despise you, let me count the ways. Lest you think this corked wine somehow jinxed my trip, that's not the case. Everything is going fine so far. And when I get home I'll open something nice with BrooklynLady. I thought a little Almondine Bakery action might be in order for your Friday. Thus far I've shown you merely one little photo of a baguette end. Almondine recently opened a second outpost, this one, thankfully, in Park Slope. In a few short weeks this place already has proven to pose a serious threat to my waistline. Almondine makes perhaps 200 baguettes each day at their main location in DUMBO. About 40 of these come to Park Slope. Their French baguettes are crisp and chewy on the outside, light and airy in the inside, and have a delightfully mellow buttery flavor. I have yet to try the wheat flour Almondine Baguette, as the French baguette is so good. I spoke with Jocelyn, the manager, and asked him what they do to make the baguette so good. He told me about Benin where he was born and raised, Paris where he lived for over a decade, and all sorts of other things. But he simply smiled and laughed when I asked for details on the baguette. Nothing. Not a word. Almondine is not only about bread. The pastries are impressive, especially in the early part of the day when they're fresh. They make delicious macarons, for example. My older daughter has sampled a few of them now, and seems to have settled on purple (currant) as her favorite. I find myself gazing longingly at apricot and pear tarts. I like the way the fruit is a bit burned in some places. And although I've never been a big eclair fan, don't these look good? There are many other beautiful pastries, many of the things you would see if you were in Paris and wandered into a good pâtisserie. Almondine also serves soups, sandwiches, salads, things of that sort. I haven't tried these, and I cannot imagine trying them, to be honest. I'm sure they're fine, perhaps even very good. But when the baguettes and pastries are this good, why play games with soup? Right now I'm eating a bowl of orecchiette with turnip greens, and it's completely delicious. I seasoned the dish with a little bacon, a small garlic clove, a few dried red chili flakes, and a very small glug of cream. Bound it all together with a good glug of the pasta cooking water. This is the kind of pasta dish that my Jewish father from the Bronx would be frustrated by. "It has no sauce," he would say. "It needs a sauce." In my rudimentary (and rudimentary is a generous word here) understanding of pasta, pastas with fillings, like ravioli, are not meant to be sauced. Some brown butter and sage, perhaps, but no ragu, no pesto, no clam sauce. Those sauces are for spaghetti, penne, linguini, and other un-filled pastas. So in a sense, my father would be right - my orecchiette dish doesn't have a sauce, and it's not a filled pasta, so it should have a sauce. But I'm using the pasta as a vehicle to enjoy the glorious combination of braised turnip greens and bacon, and for me, that is sauce enough. Of the various braising greens such as collards, kale, and chard, my favorite for braising are turnip greens. They have great texture and a nice earthy-turnip flavor, and they absorb other flavors very well. They have a particular affinity for cured or smoked pork products, and thankfully, humans discovered and widely shared this bit of culinary knowledge. Turnips are in season. If you buy turnips, save the greens and try something like this dish. Think about this: turnip greens = earthy, bacon = umami, chili flakes = spicy, garlic = savory, and cream = sweet. An almost complete combination, but no sour. I considered a squeeze of lemon for sour, but it somehow didn't seem right. When I decided to make this dish, I had no particular wine in mind. I considered a St. Joseph, imagining the marriage of bacon flavors. But I decided that Syrah, particularly young Syrah, which is all I own, would overpower everything but the bacon. I considered a snappy and vibrant bottle of Pian del Ciampolo, the un-oaked Sangiovese from Montevertine, but sadly, I don't actually own any of that wine. I considered a white from Friuli, like the i Clivi Galea, the Tocai/Malvasia blend, and in retrospect, that probably would have been a great pairing. But I drank the 2007 Mugneret-Gibourg Bourgogne, $32, Michael Skurnik Wines. A lovely Bourgogne, not as impressive as the 2006, as the 2007 doesn't seem to handle its wood treatment as well, but lovely nonetheless. Why did I open this bottle? Because sometimes agonizing over the right pairing is tiring, especially when I am putting the kids to bed, stressing about work, and simply feeling tired. I wanted comfort. For me, this wine conjures something very comforting. And if it totally failed with the pasta, I could recork it and open something else. It didn't fail, it was fine. But this dish deserves better than fine. May I ask, what would you pour with this type of pasta dish? Does my Favorite Thanksgiving Wine make me a Bad Person? Of all of the wines I drank over the long Thanksgiving weekend, my favorite was, without question, a wine from Tuscany. My friend Mike most generously opened and shared his only bottle of 1990 Tignanello. Yes, I drank a Super-Tuscan, and I loved it. And I love the fact that I loved it. Tignanello is not hipster wine. The card-carrying Natural Wine crown probably has little or no interest in Tignanello. Some of them would probably wave their hand at Tignanello, brush it aside. This is part of something that I find rather silly in the wine world right now - it can be clique-y and shallow, like high school. People identify with a group (think Goths, punks, hippies, jocks, etc.) and give themselves fully unto that group, ceasing to think for themselves. It becomes easy when you're a punk to assume that whatever the hippie or the jock said is lame. But did you really listen? Of course not. Well, I listened to 1990 Tignanello, and I'm so happy that I did. As President Obama likes to say, "Let me be absolutely clear about this." The 1990 Tignanello I drank was a gorgeous wine. Mike decanted it an hour before we drank it, and I was worried that all that oxygen would deaden the wine. Not so. It was very much alive, and in my Burgundy glass it smelled like the fluffy underside of a well-worn very fine leather belt. There were tobacco notes too, and the mellowest of stewed red and orange fruits. This wine continued to blossom in the glass, so full of character and charm, such a complete and beautiful expression of mature red wine. Its fragrance stayed with me for quite a while after the last sip. The new release of this wine, 2006 I think, costs about $80, and it seems that it will run you over $200 if you want to buy the 1990. So I'm not going to start filling my cellar with this stuff. But that wasn't my point anyway. What interests me here, outside of the beautiful moments of actually drinking this wine with friends and talking about it, is the idea that some people think there is something intrinsically wrong with Tignanello. The Antinori growers and wine makers were amongst the very first to blend Tuscan Sangiovese with the non-native grapes Cabernet Sauvignon and Merlot. Tignanello contains about 10% Cabernet Sauvignon and 5% Merlot. Antinori's Tignanello was a big part of the beginning of the Super-Tuscan craze that ultimately ended with the huge Brunello scandal. Jeremy Parzen of Do Bianchi is an expert on the whole Brunello scandal, so check out his writings on the subject if it interests you. Tignanello, by the way, is a vineyard of 47 hectares. Think about how big that is - 47 hectares. Imagine how many bottles they produce every year, bottles that retail for upwards of $75. We're talking about Bordeaux-type revenues, here. Is this wine partly to blame for the bastardization of Tuscan wine? Is Tignanello bad? And if it is bad, can it still taste good? The 1990 tasted great, that much I can tell you. A Trip Cut Short, a Red Wine from Chablis, and a lot to be Thankful for. About a year ago I went to France to meet my friends Peter and Tista. 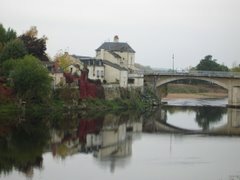 The plan was to spend a few days in Burgundy and then a few more in Champagne. My wife was 8 months pregnant with our second child. It was a bold move to go overseas at that point, but BrooklynLady was fine with it – she actually encouraged it, once our doctor cleared it. She was entirely healthy and not expected in any way to deliver early, so why should it be a problem? Off I went. Several days into the trip, while still in Burgundy, my wife had contractions that were more real than the 'Braxton Hicks' contractions that typically happen a month or so before birth. I took the next flight home, and thankfully nothing happened – our daughter arrived a month later, as expected. The night before I left Burgundy and returned to NYC, Peter, Tista, and I stayed up late talking and drinking Dujac Malconsorts and Clos de la Roche until something like 2:00 AM. The next morning Peter and Tista also left Burgundy, returning to their homes in Champagne. They stopped en route for lunch at one of Tista’s favorite restaurants in the Chablis area, a place called Le Soufflot in the village of Irancy. Although they were certainly as tired and probably as hungover as I was, Peter and Tista valiantly agreed to sample one of the local wines alongside their lunch. They drank a red wine from Irancy, a wine made by one of the finest producers in Chablis, Vincent Dauvissat. A month or so ago Tista was in New York representing Salon/Delamotte at a large tasting event. He came to my house for brunch one morning and he brought a gift with him, something he wanted me to have the opportunity to drink - a bottle of that same Dauvissat red wine from Irancy. As far as I know, the wine is not imported. I let it recover from its journey for about a month and drank it with BrooklynLady the other night, with the beautiful birthday dinner that she made for me - rosemary scented rack of lamb and butternut squash. I thought it was much more about Chablis than about Pinot Noir. And yes, Irancy is not Chablis, it is 20 kilometers away, but the soils are similar. There was a seaweed, brothy, salt air, savory tone to the nose, and this carried through on the palate. There were little hints of dark fruit, but the fruit in this wine was really just a vehicle for the transmission of terroir. When drinking it on its own, there seemed to be a green edge to the tannins, something that has plagued many 2004 red wines. But this wine is from Chablis, not the Cote d’Or – should that hold true here? I really don’t know. With food, that green edge was gone. This was a challenging and very rewarding wine. We thoroughly enjoyed this wine, as much for how good it was with our dinner as for what it represented to us: a reminder of the times just before and after our second daughter was born. Those were times of great anticipation and uncertainty, and also very wonderful times that a person is lucky to experience. I am lucky enough to have experienced them twice now - I have two truly amazing little daughters, and a very happy and healthy wife. And for those things above all else, I am thankful. Isn’t it nice that a savory little red wine, from an off vintage in Chablis, given to me by a good friend, can remind me of that? My wife, a clear-thinking woman in her mid 30's, somehow found herself going to see that new vampire movie on a recent Friday night. The one with the cute couple - British guy and American girl, all over the cover of People magazine. You know the movie I'm talking about. When the wife goes out and I'm home alone with the two sleeping kids, I tend not to drink anything fancy. After all, one of the things that makes a wine great, is drinking with some one else and talking about it. But it can be a real pleasure to open a special bottle when I'm on my own, a wine that perhaps BrooklynLady doesn't enjoy as much as I do. On this recent Friday night, as my wife watched cute and vicious teenage vampires do their thing, I warmed up the last of my French green lentil stew studded with baby white turnips, said turnips' tender greens, and bits of thick cut bacon. And I opened a bottle of wine that I was excited to hoard all for myself, the 2006 Jacques Puffeney Trousseau Cuvée les Bérangères, $30, Imported by Rosenthal Wine Merchant. Actually, I opened it as BrooklynLady was getting dressed to go out, and I poured her a skimpy little glass. I asked her how she liked it as she put a clip in her hair - "Not so much," she said. "It tastes tomato-ey." Perfect. This one is all mine, baby! And I don't get anything tomato-ey. I get a lot of warm dry soil, some sweet/tart red currant type of fruit, and something most definitely gamy. This is such a delicious wine, beautifully perfumed, perfectly balanced, but not at all polished - the tannins jut out a bit, the acid is the tiniest bit volatile, and there is a vivacious energy running through this wine. It was at its best after two hours in the decanter - intensely perfumed, but graceful and clear as a bell. It was perfect with my earthy lentil dish, providing a lot of lift. It's things like this, this simple bowl of lentils with this vibrantly interesting wine, that remind me how staying home alone on a Friday night can delicious in its own way. Trust me - this wine is so much better than cute vampires. We've been delving further into domestic cheeses lately with some very good results, mostly. It continues to fascinate me, the challenge of pairing wine with cheese. In my opinion, which in this case is even less well informed than most of my other opinions, red wine is just too difficult to pair with cheese. They both tend to have such powerful aspirations, how can they avoid doing battle with one another? I find myself wanting to drink whites with cheese, the only question being whether or not the wine should have residual sugar. We've tried the cheeses I mention below several times, with various wines. Here are a few recent pairings that worked. Please feel free to chime in with any suggestions of your own. Jasper Hill Farm Bayley Hazen Blue Cheese, paired with 2002 Domaine du Closel Savennières Moëlleux Les Coteaux, $28, Louis/Dressner Selections. Jasper Hill Farm might be the last great hope for artisanal cheese in Vermont. Mateo and Andy Kehler raise their own cows and make their own cheeses, but they also cellar small-batch cheeses made by other dairy farmers, including the famous Cabot's Cloth Bound Cheddar. Their Bayley Hazen Blue is a raw milk cheese that's aged for at least four months, and it is distinguished by its great balance. Not too salty, not too sweet, this cheese tastes of fresh butter, with herbs and roast nuts. It is crumbly and dense, not creamy like St. Agur. There are many wines that would be great with this cheese, but after one nibble, I knew that I wanted something sweet. The wines of the Savennières appellation are typically dry, but in 2002 the Domaine du Closel made a sweet wine. It was a great match, the herbal flavors of the wine enhancing the same flavors in the cheese. The rich, somewhat viscous texture of the wine enhancing the cheese's lean and sprightly characteristics. I've had this wine as an apértif in the past year, and it was far better with cheese than it was on its own. Jasper Hill Constant Bliss, paired with 2007 Paul Pernot Bourgogne Blanc, $18, Jean-Marie de Champs Selections. This is a Chaource-style (in the Champagne region) cow's milk cheese. It is aged longer than Chaource cheeses (thank you, flavorful bacteria-averse FDA regulations), and the Jasper Hills folks say that it doesn't really resemble the cheeses of Chaource. This is delicious cheese, plain and simple. The best wine pairing I've found so far is the fabulously over-achieving everyday Bourgogne by Paul Pernot, which in the classic vintage of 2007 manages to be both lighthearted and serious. It shows hints of everything that makes white Burgundy wine so great - ripe fruit, delicate floral and stony aromas, and inner layers of texture that fade in and out. Meadow Creek Dairy Grayson, paried with 2006 Pierre Frick Sylvaner Cuvée Classique, $13, Fruit of the Vines Imports. This is a raw milk washed rind cheese from the mountains of south-western Virginia, made somewhat in the style of the classic Italian Taleggio. Meadow Creek Dairy practices an earth-friendly form of cattle farming and cheese making. I have no data to back this up, but I hereby assert that Meadow Creek dairy is partially responsible for the fact that in the recent Presidential election, the great state of Virginia voted Democratic for the first time since 1964. In any case, this is delicious cheese. It is not a runny washed rind cheese, it retains its bouncy form even after several hours at room temperature. It is pungent, but not at all overpowering, with grassy and fruity flavors. Better to cut around the rind though, in my opinion, as it offers little to no flavor, and it adds an unpleasant brittle, waxy texture. Frick's bone-dry Sylvaner is great with this cheese. The floral aromas bookend the pungent, buttery cheese perfectly, and the almost startlingly dry wine accentuates the cheese's clean grassy flavors. Last week, for the first time in several years, I was really sick. I didn't have a drop of wine for five days. Sounds crazy, but it's true. Imagine not drinking wine for five whole days! You'd have to be in prison, or shipwrecked, or completely knocked out with the flu. My cold was bad enough so that I didn't even miss wine, actually. But one must eat and drink, even when sick. So what does a guy like me think about ingesting when he's on the sick-wagon? Phở. Chicken soup might be more traditional for us Americans, but when I'm sick I immediately think of Phở, the traditional beef noodle soup of Vietnam, and the most comforting food that I know of. It warms the body and soul, and if you garnish with the right amount of chili paste, it clears the sinuses too. My favorite bowl can be found at Cong Ly in Manhattan, at 124 Hester Street between Chrystie and Bowery. Great Phở is distinguished by the quality of the broth and the toppings. There is no better Phở broth in NYC than at Cong Ly, I assure you. There are many toppings to choose from, some better than others. When I'm sick, I just want the simplest version, Phở Tai, topped with thin slices of eye-of-round, a medley of herbs, charred onion slices, bean sprouts, and fresh lemon juice. Just look at that bowl in the picture above, as of yet untouched by my waiting chop sticks. McVitie's Digestives. I cannot stop thinking about these things. Nothing more than round wheatmeal biscuits, but they taste so good. If they're bad for me, I can't figure out how from reading the ingredients. A good hot cuppa, a few of these, who wouldn't feel better? My daughters seem to like them too, and now they bum-rush me whenever they see the brightly colored package. But I don't see why I should share, I'm the one who is sick. Good bread. Almondine bakery opened an outpost not too far from me and sells what I think is the best baguette in NYC. Crusty and a bit chewy on the outside, light and flavorful on the inside, irregular and lumpy, this is a beautiful thing. Eating one makes me understand the endurance and and ubiquity of the baguette - most are just terrible, but we keep buying them because we once had a great one, and we continue to search for that experience. In Brooklyn, here it is. More on the new Almondine spot soon. Good reading. Dr. J's recent writings reminded me that I hadn't yet read Kermit Lynch's classic book, Adventures on the Wine Route. I tore through it during these five days and it was perfect - completely engaging but not terribly demanding, perfect for reading with a slight fever at 1:30 AM when you can't sleep. That sounds like a slight, and I don't mean it that way at all - this is a classic for a reason. The book is informative, inspiring, entertaining, and Lynch's passion is contagious. Kermit Lynch is definitely a pioneer. Do you remember when you first heard of Domaine Tempier? Of Charles Joguet? Of Vieux Télégraphe? While I was sick I thought of many wines I wanted to drink, and the meals that I would enjoy with them. Yet what was the first wine I drank when I was able? A simple country wine, a Gamay from the Côte Roannaise, and it was delicious. I need to drink simple wine more often. 1) Immediately inform everyone that the wine is corked. 2) Wait until everyone has had a chance to taste the wine, then inform the group. 3) Wait until everyone has had a chance to taste the wine, hope that some one else informs the group, if no one does, inform the group yourself. 4) Don't say anything unless the host notices the wine is corked. 5) Hey - I'm not positive that I would notice it myself. Many readers agreed with Alex (whose comment contains an amusingly off-color typo - whoops, should I not have informed?) and Jack who said that the answer to the question depends on who is hosting and on the situation, and that the telling should be done in a discrete manner. The general sentiment seemed to be that the wine-geek host can take the news, but "civilians" might not be able to. But 102 of you responded to the poll, and the most popular response (35%) was #1 - immediately inform everyone that the wine is corked. That's far from a majority, of course. But it is quite different from the sentiment expressed in the comments. Perhaps those who picked this answer assumed that it is a wine-savvy group at dinner. The 2nd most common (26%) answer was #3 - wait until everyone has had a chance to taste the wine, hope that some one else informs the group, if no one does, inform the group yourself. This is the one that I personally believe in almost all of the time. Although I respect it, I do not subscribe to the "never say that the wine is corked, no matter what" philosophy. Once I was a dinner guest at a highly knowledgeable wine maker's house, along with two of my friends who are incredibly knowledgeable wine professionals. The wine maker and one of my companions are friends. We began the evening with a vintage Champagne that I very much enjoyed. We ate wonderful food that night, and drank many wonderful wines. After leaving the wine maker's house we were discussing the night's wines and both of my friends agreed that the vintage Champagne was mildly corked, mildly enough so that it was difficult to discern, but mildly corked. I remember feeling surprised that they hadn't brought this up while we were drinking the wine - I assumed that the wine maker would have also noticed, or at least would have been interested to hear this opinion. I would have loved to taste the wine again, to learn about what it was my friends had noticed. Several times I have served wine to fellow wine lovers who waited for me to point out that the wine is corked or otherwise flawed. I appreciate that because it is such a polite way of handling it. But it makes me wonder...what if I hadn't noticed? Would they have said nothing? Would they allow me to remain ignorant about that wine? I sincerely hope not. How many times have I served flawed wine to wine-savvy guests who noticed, but said nothing? If the wine-savvy host doesn't notice a flaw, saying nothing seems like a shame to me. There are delicate ways to say things, and clearly this is a person who wants wine knowledge. Help them, for goodness sake! By the way, I try to find a delicate manner of informing even the non wine-savvy host too, and whichever of their non wine-savvy guests appear interested. It's not the same thing as telling the host that the cake they baked is too salty, or that the spaghetti they made is overcooked. The host made those things, and it obviously would be unacceptably impolite to criticize the host's cooking. But the host didn't make this wine - they purchased it and are not responsible for the flaw. And "too salty" and "overcooked" are matters of opinion. Cork taint is tangible, much more like spoiled milk than like "too salty." Perhaps the host would appreciate learning how to recognize this flaw. I appreciate the premium placed on politeness and deference to the host's feelings, and clearly the social rhythm of the evening should not be risked over corked wine. But I also think that excessive politeness inadvertently advances the sad idea that wine and wine knowledge are for only the privileged few among us. I know that sounds counter-intuitive, but bear with me a minute. When you don't take the opportunity to teach someone that a wine is flawed, you help them stay ignorant. You allow them and their guests to eat stale bread without explaining what stale means, without suggesting a taste of fresh bread for the sake of comparison. Why allow people to think that a flawed wine is an accurate representation of the wine? Why not seize the moment and empower people to understand and recognize the flaw themselves? I'm talking about civilians and wine-geeks. I'm talking about myself. Everyone has something to learn. Just don't be a didactic wine snob when you're the one teaching, be respectful and be helpful. People are going to drink a lot of wine in their lifetime, and maybe you'll be the one who helps them understand what corked wine is, or how to discern the faintest whiff of TCA in an old bottle of Champagne. Action Required - Please Take the Corked Wine Etiquette Poll on the left. You and several other guests are at some one's house for dinner. The host serves a wine that is corked. What do you do? Please use the poll on the left sidebar to give your answer. Poll closes on Wednesday of next week. I'll tell you why I'm asking after that. If you think I omitted something in the poll responses, please let me know in the comments. Last night, after a night of many a Poulsard with friends (more on that soon), I wanted to open a bottle of good Champagne to close out the evening. But what to open? My companions included a guy who until recently worked at Michael Skurnik wines, so nothing from Terry Theise. A woman who works at Chambers Street Wines, so nothing that they sell. And a prominent Sommelier at a great NYC restaurant, so nothing off his list. I decided to open a bottle of 2002 Diebolt-Vallois Champagne Brut Blanc de Blancs, $65, imported by Petit Pois Corp. Turns out that the Sommelier has the 1997 on his list. I did my best. I tried, okay? Why are you being so judgmental? 2002 was a great year in most of Champagne and the idea is to actually hold onto the wines to allow them to reach their true potential, not to drink them frivolously after many other bottles at the end of the evening. But I don't own any of the Diebolt-Vallois 1999's, which my good friend Peter Liem says is what we should be drinking now while we wait for the 02's and the '04's to develop. And I was in the company of people who deeply love and know wine - who better to drink this with? And I have one more bottle that I will use all of my powers to save for another 5 years. So I opened it, we drank it, and it was just excellent. Even at the end of a night of many wines, it is immediately clear that this is a special drink. The nose is fresh and harmonious, the wine is quite full in body, silky in texture, the fruit is clean and ripe, the finish is chalky and refreshing. I loved the sheer class and elegance of this wine, its effortless depth, its resonant fragrance. What will happen with additional cellaring that could make this wine better than it is right now? Although it is expensive in absolute terms, I now understand how huge of a bargain it is in relative terms - you can easily spend much more than this on many Champagnes that simply aren't as good. The 2007 Domaine de la Pépière Granite de Clisson is here. I thought it was very tasty, although somewhat reserved in its expression. To be fair, this is not a wine that I can understand at a big tasting. It will be more expensive than the 2005 was, about $23, and I will happily buy it. I loved the "entry-level" 2008 Muscadets by Luneau Papin, particularly the 2008 Luneau-Papin Clos des Allées, about $15. This typically racy and stony wine showed a bit more concentration and richness than I am used to, but in a good way. Lower yields perhaps? All of the Larmandier-Bernier Champagnes showed very well. The 2004 Vieille Vigne de Cramant Extra Brut Blanc de Blancs, about $100 was well balanced and delicious, but my favorite on this day was the Terre de Vertus Brut Nature Blanc de Blancs Premier Cru, about $80 (based on 2006, but not a vintage wine). I thought this wine was simply fantastic, with pretty floral aromas layered atop the salty rocks. I want it. I liked François Pinon's 2008's even more than I did the 2007's at this early stage. The 2008 Vouvray Cuvée Tradition, about $21, was sweet but well balanced and with good acidity, and the 2008 Vouvray Silex, about $26, was an awesome wine, very pure, with beautiful fruit, great structure and balance. I think that I prefer François Chidaine's Montlouis wines to his Vouvrays. I'd love to test this little theory with many bottles, some friends, and dinner, but so far, I think I like the Montlouis wines better. They just seem more complete to me. The 2007 Chidaine Montlouis Clos du Breuil, about $30, a sec, or dry wine, is herbal and complex with woolly fruit. 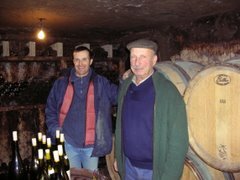 The 2007 Chidaine Montlouis Clos Habert, about $30, a demi-sec, or off-dry, and always a favorite of mine, was ripe and restrained and exuberant and about fruit and mineral and wool and soil. I loved it. I really liked both of the Clos du Tue-Boeuf Pinot Noirs from Cheverny. Thierry Puzelat makes a load of different wines under his own label and also under this one, and it can be hard to keep track of what's what, but that's all part of the fun. The 2008 Clos du Tue-Boeuf Cheverny Gravotte, about $24, is 100% Pinot Noir from 30 year old wines on chalky soil. It smells of dried roses and is bright and elegant on the palate, with a definite chalky feel. The 2008 Clos du Tue-Boeuf Cheverny Caillère, about $28, is also 100% Pinot Noir from vines of about the same age, but from clay soils. The wine is darker and richer, very earthy and animale. Both are delicious wines, and very expressive of their place. Many of you already know the late Baldo Cappellano's wines. I had never had one until this tasting. I appreciated all of them, but there are two that simply blew me away. The 2004 Cappellano Barolo Pie Franco (from un-grafted vines), about $165, is too absurdly brilliant of a wine to try to describe for you. A truly complete wine of incredible clarity, this left me speechless. And I also loved Cappellano's Barolo Chinato, about $100. The Cappellano family apparently was one of the first to produce this drink, a maceration of wine, quinine bark, and spices. There were five Chinatos poured, including a Roagna Barolo Chinato,and the Cappellano version was playing a whole different game. Floral and spicy, completely harmonious, and with a lingering sweet spicy quinine essence, this is an utterly delicious drink. It was more like a festival - think Cannes, Burning Man, or Fashion Week, perhaps the G8 Summit. People came from all over the world to participate. Deals were struck, friends and enemies gained, and the powerful giant that is Louis/Dressner Selections showed the world that there is no such thing as a recession when it comes to the world of fine wine. At least two heads of state showed up - President Pierre Nkurunziza of Burundi and Prime Minister Stephen Harper of Canada enjoyed light conversation while tasting through the Clos Roche Blanche wines. P-Diddy made an appearance, as did Martha Stewart. Wine bloggers, writers, and wine bulletin-board junkies from as far away as San Francisco, North Carolina, and Wall Street made the pilgrimage to this, the Mecca of industry tastings. Dressner did cut a few corners this year, for example by refusing to hire staff for the tables and thereby forcing wine makers from small villages scattered throughout the Loire Valley to travel all the way to NYC to pour the wines themselves. Speaking of the insatiable drive to maximize profits, I heard all sorts of juicy rumors, including this blockbuster, which I have not yet confirmed but is good enough to share anyway: Louis/Dressner, in what can only be described as a corporate attack, is attempting to buy controlling shares in Savio Soares Selections and Jenny & François Selections, thereby consolidating his control over the natural wine selecting industry. As a consumer, I hope this rumor proves false, as although I admire and respect Joe Dressner, even he cannot be trusted to wield such power generously. I love the Saumur-Champignys from Domaine Filliatreau. The entry-level cuvée (I've seen it called Saumur-Champigny Cuvée Printemps, Chateau Fouquet, and simply, Fouquet) is an excellent wine that delivers the same quality as Bernard Baudry's entry level wine Les Granges, but in a different style. Filliatreau's is a lighter wine that emphasizes juicy freshness and fruit. The nose on the 2007 Fouquet, about $17, is very floral and the palate has an appetizing meatiness - it is delicious wine. If forced to choose, I would buy the 2008 Chateau Fouquet, with its bright nose of red fruit and a clean, energetic, and ripe palate. This is not complicated wine, nor does it seem to be a good candidate for the cellar, but it is perfect in its simplicity. And at about $17, it's money well spent. A few bucks more buys the 2008 La Grande Vignolle, price unknown but probably about $20, a wine made from old vines in the huge Grande Vignolle vineyard. This wine drinks well young but also does well with some bottle age. I loved the 2005, not as much the 2006, never saw the 2007, and now we have the 2008. I thought it was great, with a mineral imbued darkly fruited nose, very clean, and a deeply fruited palate with grainy texture and firm tannins that will support more than a few years in the cellar. In other Saumur-Champigny news, the 2005 Clos Rougeard wines were very impressive. I was worried that they would be inky black and impenetrable, but they weren't. The 2005 Le Clos was wide open and ready to go, crystal clear and with beautiful fruit. I loved the dried roses I was getting on the back of the nose, and the wine had such good depth and length. I would have a hard time keeping my hands off of this, if I owned any. But that's the problem - these wines get tougher and tougher to own every year. This wine is now about $65 here on the east coast. I'm not saying that it isn't worth the money, but it has definitely crossed into a different zone, price-wise. The 2005 Les Poyeux was more dense, darker, very rich, much earthier, and clearly needs lots of time. But it was also very beautiful, and at about $85, is probably worth the extra $20 if you are forced to pick one. Le Bourg was not shown. How I wish I was buying these wines 8 years ago when they cost something like $30 a piece! I've had the 2007's from Bernard Baudry before, and I still think they're fantastic. The 2007 Cuvée Domaine is maybe the finest red wine that I know of at $18. 2007 Clos Guillot at about $30 is so graceful and elegant, but with such deep fruit. The vines are young but the wine feels wise and centered, and it has the tannins and intensity to age well. This was my first time tasting the 2007 Croix Boissée, about $35, and I liked it very much. It is deeply perfumed, and the palate is rich and complex. It confused me, though, how much I noticed the oxidative style of the wine - it hasn't been so clear to me in the past. Perhaps the 2007 shows it more pronouncedly, or perhaps I am getting better at noticing it. But the wood influence shows itself here, not in an oaky aroma or flavor, but in the way the oxidization that happens in barrels makes the wine stands apart from the others in the lineup. It is excellent wine, but I think I need to open a bottle at home and see what's what. I might be some one who now prefers Les Grézeaux, we'll have to see. Okay, this post is too long already, so more Tales from the Dressner Portfolio Tasting will come soon. I did a careless and irresponsible thing, and I want to say that I'm sorry. The Yankees were dominated in the first game of the world series last night. The other team's pitcher was brilliant, the Yanks' bullpen has become a liability, and they were simply outclassed. But none of this would have happened had I made a better beverage choice. I went to the same friend's house where I watched game 1 of the division series versus the Angels, when I brought beer. I had no beer to bring, so I brought wine. I figured that Bordeaux and California wines seemed to give the Yanks the lift they needed in the division series, so I brought the only such bottle I had in the house, a California Cabernet that I received as a sample called Josh. That's right, the wine was called Josh. It would have been more at home if it were spread on a piece of whole wheat toast. And this is exactly what did the Yanks in. Tonight I will drink what's good and right, and I hope that the Yanks and you will accept my apology. Will not happen again. The DBGB wine list is very good, no matter what the Times said. Two weeks ago Sam Sifton, the new NY Times restaurant critic reviewed the new addition to the Daniel Bouloud empire, DBGB. Very positive in general, Sifton said this about the wine list: "Totally acceptable selection, but much better to experiment among the 23 beers on tap and large selection of bottled beers that have traveled here from Britain, from Brooklyn, from Germany, from France." I must emphatically disagree. The beer selection would please any beer lover, that's true. But to denigrate this wine list as merely "totally acceptable" is simply off base. There are plenty of inspired and interesting choices, many of them at very reasonable prices, and the wines were clearly selected to compliment the refined-rustic dishes of head cheese terrine, ham hock rillette, and sausages of all sorts. We had a 2006 Bornard Poulsard La Chamade for $54, Savio Soares Selections, and that's better than totally acceptable. Not that Daniel Bouloud needs my help in defense of his wine list, but this just makes me miss Frank Bruni, I guess. Alternative Closures - the Bottle Cap? I drank a bottle of 2006 Pierre Frick Gewurztraminer Rot Murlé, $22, Imported by Fruit of the Vines, the other night with a stew of French green lentils, carrots, and sausages. The wine was perhaps the driest Gewurz I've ever had, and it was delicious. But we were tired that night and made it through only half the bottle. Which is when I resented the bottle cap closure. I wanted to enjoy this wine the next day, so I dug up a Vino-Lok I saved and used that. The wine was even better the next day, what an amazing nose! But the bottle cap closure thing, I'm not sold on this. What do you think about this? Fall is here and my fishmonger has blackfish heads and racks for stock. I made my first fish soup of the season. I've been working on this dish for years, and I like to change it each time, trying out different flavor combinations. This time I went with less heat from dried chilis, less tomato, and more anise. I added fennel to the shallots for the aromatic base of the soup, and also a good glug of Pastis to help scrape the pot before the broth went in. Must say, pretty darn good. And the 2008 Domaine de la Pépière Clos des Briords, $16, Louis/Dressner Selections, was a great pairing. I made a Biryani-style dish of rice baked with beef shank, loads of spinach and parsley, and spiced with dried chilis, ginger, and cardamom. So satisfying, and delicious with the 2007 Domaine des Huards Cour-Cheverny, $17, JD Headrick Imports. The oxidative style (my friend said there was an under-the-veil sense to the wine) and the herbal character, the richness of the fruit worked perfectly with this dish - a harmonious pairing. This is part of an ongoing effort to make interesting and delicious dishes involving copious amounts of spinach - I want my kids to want to eat spinach, and not through trickery, but because it tastes good. I want them to drink Cour-Cheverny too, when they're a little bit older.